ExpertOption Review — Is It One of the Best Brokers? I’m writing this ExpertOption review because it is one of the most popular binary options brokers. After the review, I include some interesting complaints I found on the web. Click here to visit the official ExpertOption website. This is my personal opinion; you can make your own conclusions at the end. You can leave your review at the end. ExpertOption is a reputable binary options broker created in 2014. Since then, they have revolutionized binary options trading! They offer top-notch trading services on a state-of the art trading platform. The trading platform is owned and operated by ExpertOption Limited. That’s a financial company registered and headquartered in Kingstown, Saint Vincent and Grenadines. To avoid a situation where a rogue broker pretends to be a regulated broker, I investigate every claim. I directly contact the regulatory body in question. From my investigations, ExpertOption is fully regulated by Financial Markets Relations Regulation Center under certificate number 0395AAVv0113. In addition, they are also subject to regulatory oversight by Vanuatu Financial Services Commission (a government financial commission). Trade at ExpertOption is on an innovative, powerful trading platform. The platform is available online, so no download is necessary. You only need a browser and an Internet connection to trade. Also, apart from the platform’s sophistication, it is very easy to use. 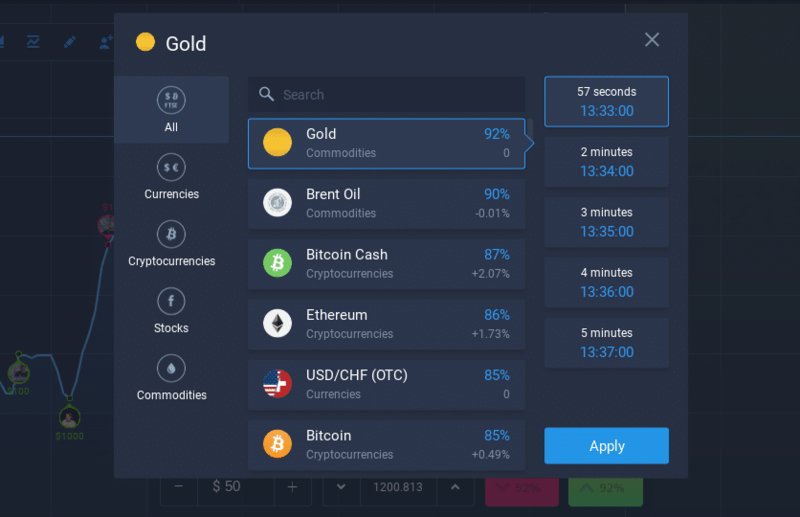 Unlike most other brokers, the platform is so advanced that traders can open new trade positions directly from the charts. In addition, the trading platform incorporates cutting-edge technologies. This allows for fast trade executions. As expected with any broker of ExpertOption’s caliber, the selection of assets is extensive. I was able to successfully open trading positions on a wide array of currency pairs. This includes major and minor currencies. That’s not all. They also offer a number of exotic currencies. In addition, I was able to trade in commodities, global stocks, and stock indices. Assets available can be traded within acceptable expiry times. For now, ExpertOption only offers short-term trading. Expiry times include 1 minute, 2 minutes, 3 minutes, 4 minutes, and 5 minutes. Option types include high/low and call/put. The minimum trade at ExpertOption is $1. This makes trading affordable. ExpertOption also offers competitive payouts for in-the-money trades. These can be as high as 90%, depending on the asset and expiry duration. There are also Windows and MacOS apps. ExpertOption also offers a wide array of cryptocurrencies. These cryptos include Bitcoin, Bitcoin Cash, Ethereum, BTC/CNY, Tether, and Ethereum Classic, Monero, Zcash, IOTA, Dash. But you can only trade them as binary options for now. They even released their own crypto coin, the EO, and a cryptowallet at eo.finance. 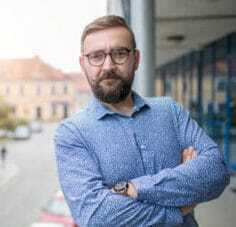 ExpertOption CEO Ivan Opria said “We are designing an ecosystem which will make every online trader convert to crypto with no more than a few clicks and we will be there to help them make the jump”. However, for crypto trading and wallet I would suggest you read my Hodly wallet review, and use this instead of eo.finance. Let’s continue with more important aspects of this ExpertOption review. At ExpertOption, I made a deposit unassisted. I had a dozen payment methods to choose from on their banking interface. 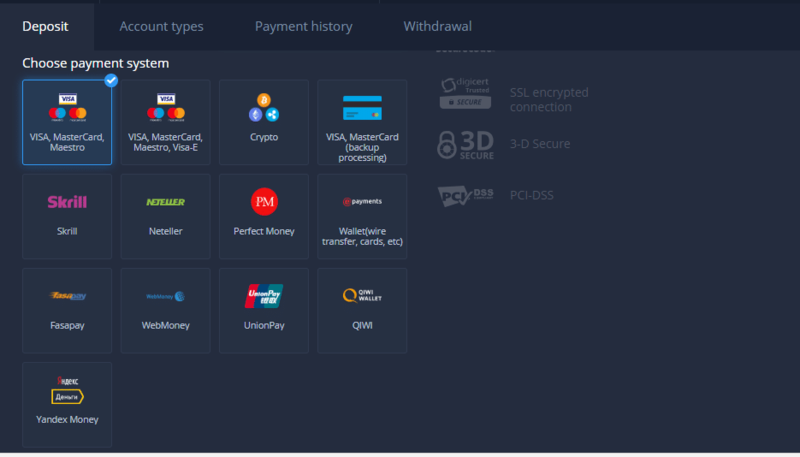 They accept payments from credit/debit cards, wire transfers, Skrill, WebMoney, and NETELLER,UnionPay, OrangePay, ePayments,Perfect money, WebMoney, Yandex Money and more. The minimum deposit you can make is $50. However, they give the option to open a mini-account. This mini-account has lower minimum deposit requirements, standing at $10. My funds reflected almost instantly after I submitted my card details. That is a plus! Making a withdrawal at ExpertOption is also not complicated. They do not special how long a withdrawal will take. But they wired money to my bank account fairly fast. In fact, it was within 5 days. Other withdrawals methods: credit/debit cards and eWallets take somewhere between 2 to 3 days. Withdrawals can only be processed via the same method used to make a deposit. Otherwise, you have to connect with their finance department. I was not charged fees for opening or closing trading positions. That is a good sign. I also understand that they don’t charge any maintenance fees on dormant trading accounts. I couldn’t leave the demo account out of this ExpertOption review. For all the brokers I have reviewed, this one beats them hands-down when it comes to demo accounts. Try the demo with one click here. ExpertOption offers a more superior demo-trading experience. First, every trader has a right to a functional demo account. Interestingly, everyone can use the demo account. Why? Because financial commitment is not necessary. As a matter of fact, you don’t even have to register! You only have to click the “demo account” link on the homepage. Then, you are redirected to a demo account. The demo accounts come pre-loaded with $10,000 in virtual cash. Upon depletion, you can always open a new one or request a top-off from customer support. You can also visit my guide of the best binary options brokers with demo accounts. If you are after that financial push, then ExpertOption is your ideal destination. They offer mouthwatering deposit bonuses to new and existing traders. Their bonuses come as high as 125%, up to $2,500. It is important to note that the bonuses are subject to a wagering requirement. This is stipulated in their terms and conditions. My opinion is to never take the bonuses. If you take a bonus of $200, you may have to place trades of $10,000 in order to be able to withdraw your winnings. Traders can open trading positions, deposit, and request withdrawals with a mobile app. In fact, they also have a wealth of educational resources on the mobile app. As you can see below, the ExpertOption app on Google Play is rated by the users as a really, really good trading application. In the App Store, the app gets an outstanding #14 position among all financial apps. You can download the apps by searching the official stores or by visiting this page. ExpertOption accepts traders from all walks of life.Indonesia, Singapore, India, China, the UK and other European nations are some of the countries accepted. However, like with any binary options broker, some countries aren’t included. As you’d expect, ExpertOption does not accept traders from the United States. Canada, European Economic Area, Switzerland, Israel, New Zealand, Australia, Japan, North Korea, Puerto Rico, and Sudan. ExpertOption is user-friendly. Navigation around the site is easy, thanks to the clearly visible links on the homepage. Also, almost every interface is integrated with the trading platform. For instance, to make a deposit or access the learning center, you don’t have to go back to the home page. You can access them directly from the platform. Additionally, the website has fast loading times that improve the site’s usability. If customer support offered at ExpertOption is not the best, I don’t know which is. At ExpertOption, you can reach a customer representative 24 hours a day. However, only the English helpline is available over the weekend. Customer support at ExpertOption comes via live chat, email, or phone support. I recommend the live chat option, since you can interact with customer reps. Plus, you get replies in a matter of seconds. Customer support is available in languages like Hindi, Thai, English, Russian, and Chinese. To be honest, there are not that many complaints about ExpertOption. Maybe it’s a reflection of how good they are. However, in the spirit of objectivity, here are some complaints from ExpertOption traders. Go through them and be the judge yourself at the end of the review. “Do not trade using ExpertOption. It is a fake site to trap customers. They ask you to deposit money. At that time, they doesn’t tell you about the terms to make the first withdrawal. I added $200 and traded for some time. But I figured that the same could be rigged at the backend. So decided to take rest of the amount as refund. But, then I realized that to make a first withdrawal, you should have traded a volume of minimum $10000. Customer care, upon confrontation, said ‘We have other customers as well. Read terms and conditions carefully before investing.’ Exact words. As I say in the review above: Never accept bonuses. Bonuses are ALWAYS subject to a wagering requirement. This is true for every broker on earth. They all include it in their T&C. My name is Samiul Alam. i was start Trading on Expert on 01 Aug 2017. Today is 06 Dec 2017. Still i given Withdrawal Request they accepted. also my Amount Debit but still not Credit in my Bank Account. once i contact them they said this is your ARN NUMBER Like 24558136621228500. Go to bank and give me Written from bank letter page that you are not received money. once i Visit my bank Manager said there is no Transition with this your ARN Number. so, Bank manager given Written on Bank Letter Page. once i send to Expert Option they reply this is not Accepted document. give me another Document….. I found two complaints on alleged manipulation of trading accounts by ExpertOption. However, they seem doctored. To start, ExpertOption is user-friendly, with a well-arranged platform. This is not to mention good graphics. The trading platform is not only cutting-edge, but it is also easy to use. Also, the mobile trading apps are unique in the industry. They are fully functional, top-rated by users, and easy to use. Also on the pros is their flexible banking. ExpertOption accepts a wide range of payment methods. They secure your personal and sensitive information from unauthorized access. In addition, they use current SSL encryption technologies. ExpertOption also has one of the deepest assets collections in the binary options community. They are pretty affordable: trading can start as low as $1, and the minimum deposit is $50. Their demo account is a huge pro to both new and professional traders. Finally, they have amazing customer support. The only con on ExpertOption is the fact that they don’t offer long-term trading. In other words, they offer limited expiry durations. Is ExpertOption Safe or a Scam? Going by my experience, ExpertOption is a safe binary options broker. They had no “scammy” tendencies after I requested a $500 withdrawal. This shows that they are legit. Also, there are few withdrawal complaints all over the Internet. And the traders that use ExpertOption number in the hundreds of thousands. If you search for any scam broker, you will find hundreds of complaints. I didn’t have any trading history manipulation, as alleged by some complainants. My account history was solid from day one to day 60. There are wagering requirements to meet before a withdrawal on a bonus goes through. If you verify your account and meet all wagering requirements, there won’t be problems when you try to withdraw. The very good score by 31,000 traders on Google Play is a really good sign. There are some complaints that they reduce the payouts if you are constantly winning. Even if this is true, it is something that you can see. They do not secretly manipulate the trades so that you lose, like other brokers. It is up to the broker to give any payout it wants. If you are a complete beginner then click here to find the best binary options brokers for beginners. They have two of the best trading platforms out there. You can try their two demos on the official pages. You can also download their mobile apps. 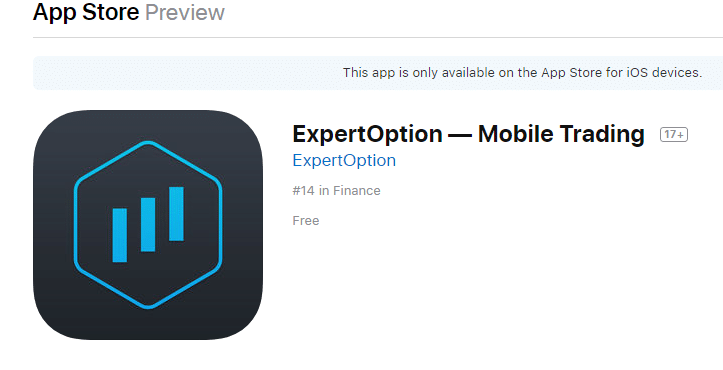 As you’ll see, Expert Option has a better app than IQ Option. As you can see in my IQ Option review, there are many more than the ExpertOption complaints. And you can find many withdrawal complaints. 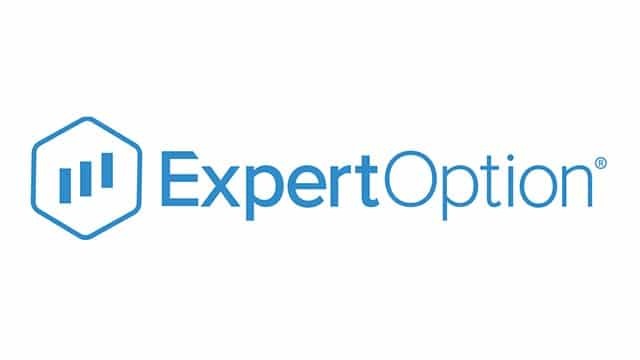 For more reasons than in the other two reviews, I believe ExpertOption is a better options broker than IQ Option. ExpertOption is a leading binary options broker established in 2015. From the moment they first opened their doors, their service delivery has been nothing short of exemplary. As a matter of fact, currently, they are among the best brokers in the industry. Their demo trading and up-to-date learning center is fantastic. There are some complaints but they are really few comparing with other popular brokers. This was my review of the ExpertOption broker. Leave your review above or your comment below! !